Just as crocus and daffodil blossoms signal renewal and the start of a warmer season on land, a similar “greening” event—a massive phytoplankton bloom—unfolds each spring in the Atlantic Ocean from Bermuda to the Arctic. But, what happens to all that organic material produced in the surface ocean? In the North Atlantic Bloom, millions of microscopic plants use sunlight and carbon dioxide (CO2) to grow and reproduce at the ocean’s surface. When the plants die, or are consumed by marine animals, some of their organic matter is transferred to the deep ocean, removing it from the atmosphere for years to come. This so-called biological pump makes the North Atlantic Ocean efficient at soaking up CO2 from the air. In fact, the North Atlantic is responsible for absorbing more than 20 percent of the entire ocean’s uptake of human-generated CO2, making it a crucial factor affecting our climate. Now an assistant professor at the Graduate School of Oceanography at the University of Rhode Island, Omand is the lead author of a paper published March 26 in the journal Science that highlights the significant role that swirling currents, or eddies, play in pushing non-sinking carbon to ocean depths. In addition to Mahadevan, coauthors of the paper are Eric D’Asaro and Craig Lee of the University of Washington, who designed the float and glider measurements, and Mary Jane Perry, Nathan Briggs and Ivona Cetinić of the University of Maine, who measured the biology and chemistry of the bloom. During fieldwork from the research vessels Bjarni Saemundsson and Knorr in 2008, the researchers used a float to follow a patch of seawater off Iceland and observe the progression of the bloom by making measurements from multiple platforms in a way that hadn’t been done before. 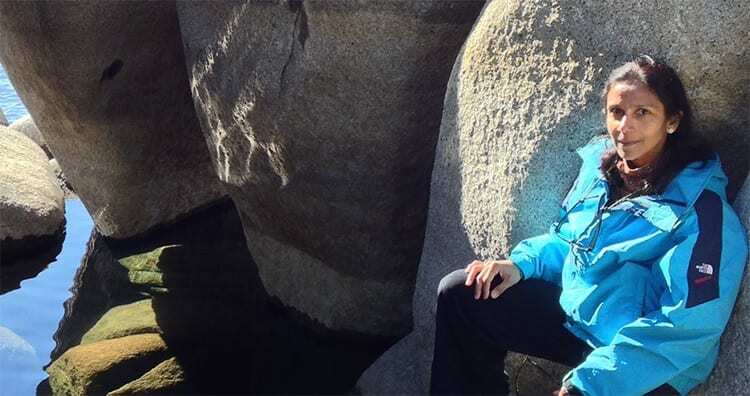 A suite of autonomous gliders outfitted with sensors were used to gather data, such as temperature, salinity and information about the chemistry and biology of the bloom itself —oxygen, nitrate, chlorophyll and the optical signatures of the particulate matter. Beginning just around the time of onset of the bloom and following its development over a month, the four seagliders gathered 774 profiles to depths of up to 1,000 meters (3281 feet). Analysis of the profiles showed that about 10 percent showed unusually high concentrations of phytoplankton bloom properties at depth, as well as high oxygen concentrations typically found at the surface. Mahadevan, an oceanographer at Woods Hole Oceanographic Institution, uses three-dimensional computer modeling to look at the dynamics of ocean eddies. Using information collected at sea by Perry, D’Asaro and Lee, she modeled the ocean currents and eddies, and their effect on the spring bloom and the phytoplankton it produced. In related work published in 2012 in Science, the research team found that eddies act as early trigger of the North Atlantic bloom. Before the sun begins to warm the ocean, eddies help keep phytoplankton in shallower water where they can get plenty of sunlight to fuel photosynthesis and growth, which contributes to the oceanic uptake of carbon dioxide. In future work, the scientists hope to better quantify the transport of organic matter from the surface to depth in other regions and times, and to relate this to variables that can be measured, including the physical attributes and the productivity of the phytoplankton. It remains to be seen whether what was learned from the North Atlantic bloom in 2008, is in fact widespread. The researchers say that learning more about eddies and the underlying physical mechanisms of the annual blooms will allow these to be represented more accurately in global models of the oceanic carbon cycle and improve the models’ predictive capability. 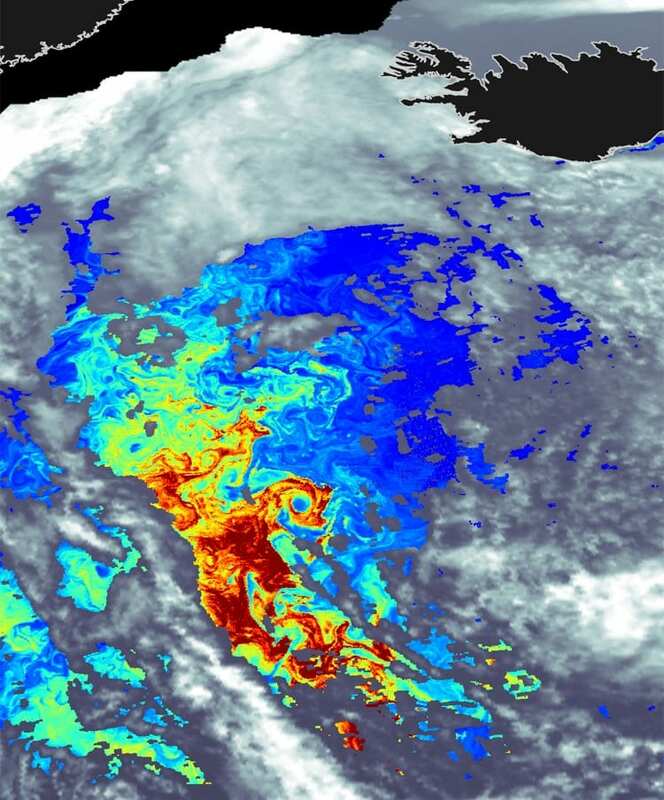 A satellite image, with eddies clearly visible, shows chlorophyll concentration in the North Atlantic during the spring phytoplankton bloom. The microscopic plants use sunlight and carbon dioxide to grow and reproduce at the ocean's surface. When the plants die, or are consumed by marine animals, some of their organic matter is transferred to the deep ocean, removing it from the atmosphere for years to come. A SeaGlider is lowered from the research vessel. 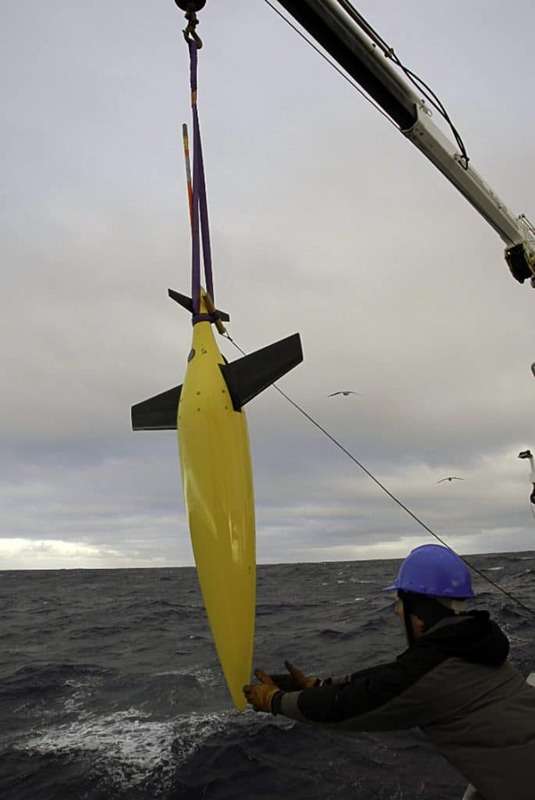 The robotic glider, which made repeated dives to depths of hundreds of meters, measured ocean properties then relayed them back to the scientists on board the ship. WHOI oceanographer Amala Mahadevan uses three-dimensional computer modeling to look at the dynamics of ocean eddies. WIth data collected at sea by Perry, D'Asaro and Lee, she modeled the ocean currents and eddies, and their effect on the spring bloom and the phytoplankton it produced.